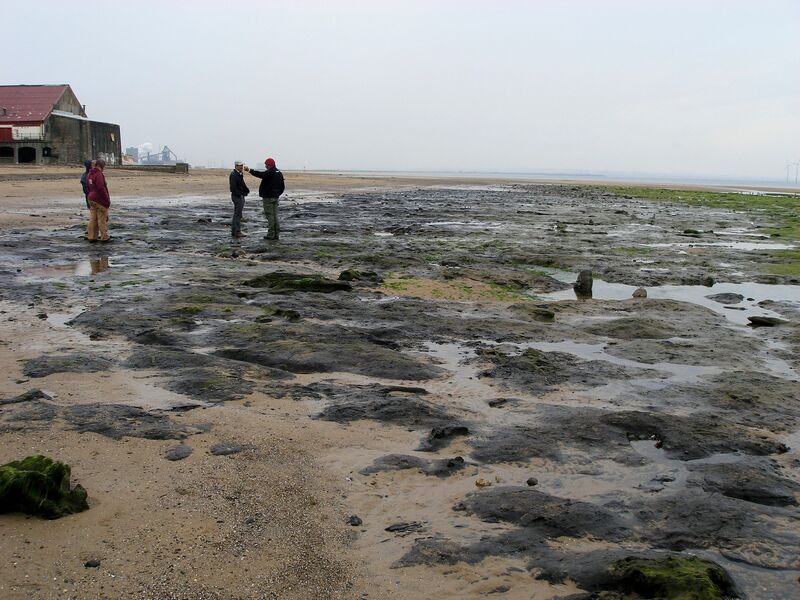 Intertidal peat beds—the “submerged offshore forest”—dating from the mid-Holocene (Later Mesolithic) are well known north of the Tees estuary (north-east England) near Hartlepool and Seaton Carew and attest to rising, or fluctuating, sea levels since the last glacial period 12,000 years ago. The peat beds south of the Tees at Redcar are less well known and studied. They are infrequently revealed on the beach and span upward of two hectares but extend north and southwards from time to time. A rare opportunity to inspect them this year (July 2013) provided possible evidence for coppicing (or elevated copparding) and one tree stump (Birch – betula) displayed possible stone axe marks executed in a fashion characteristic of the period. Historical finds recorded in the regional Historical Environment Record (HER) are also briefly summarised in this report and include a stone axe (lost, see below), bone and antler faunal remains and flints observed and reported since the 1880s. The beds are now largely recovered by sand until the next opportunity to observe them. The stone axe find itself, reported in the Middlesbrough Evening Gazette on 15 March 1986 by a dog-walking Mr A Johnson (also shown to the Dorman Museum) remains elusive—lost. I’ve written to the newspaper to see if a rediscovery is possible for proper recording in the Redcar & Cleveland HER database. Mr Johnson also reported a “strange jaw bone”. Visit the Tees Archaeology Shop to buy the research monograph about the peat beds north of the Tees around Hartlepool. Tees Archaeology Monograph Vol. 2: Archaeology and Environment of Submerged Landscapes in Hartlepool Bay, England. Mags Waughman (2005) | £15 (+ £6 p&p). I am grateful to Francis Pryor and Maisie Taylor for commenting on the images. Please note that the peat beds north and south of the Tees are extremely fragile and protected by various legislation (e.g. SSSI). Please treat them with respect and report any observations or finds to the appropriate archaeological bodies. Where possible, leave things where they are and/or take photographs with a scale measure and make detailed notes and sketches about the context. We only ever have one chance, and this shared heritage belongs to all of us. This entry was posted in British archaeology, Hunter-gatherer-fisher, Mesolithic, Sites and finds, Teesside archaeology and tagged Cleveland, Dorman Museum, England, Francis Pryor, Holocene, Redcar, Redcar & Cleveland, Seaton Carew by Spencer Carter. Bookmark the permalink.